It was a long time coming, but Thursday was a big day for what used to be called Project Jackson. Now, ground has been broken on Riverside Village at Hammond’s Ferry, a new name to reflect that it’s more than a ballpark. About 200 people turned out for the ceremony. The storm clouds of the last two days parted, but guests had to tread carefully to keep their shoes free of red clay mud. Chris Schoen, of master developer Greenstone Properties, said the stadium would be ready on time in April. He said the B&G crew that just finished the new Atlanta Braves stadium was bringing their expertise to North Augusta. Eiseman touted the team’s new website, greenjackets2018.com, which lets visitors see the view from seats in any particular section and buy those tickets. For example, if you want season tickets behind home plate, in Section 100, Row D, it’ll cost $760 per seat – about $11 per home game if the team plays 70 home games in 2018 as it will in 2017. The turnout included new Mayor Bob Pettit and former Mayor Lark Jones, who led the project through five years of efforts to derail it, including a lawsuit that took two years to wind its way through the courts and ultimately was decided in the city’s favor by the state Supreme Court. Schoen called attention to the mixed-use nature of the development, which will include a hotel/conference center, offices, apartments, single-family housing and retail. He said the finished Riverside Village would be a regional draw, luring 300,000 to 500,000 people a year, with baseball as a catalyst. 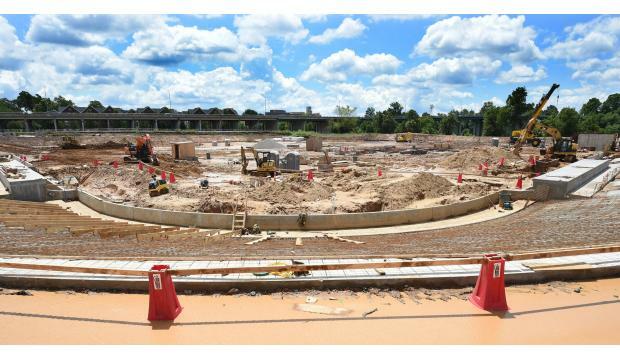 Pat O’Conner, president of Minor League Baseball, said it would be “a game-changer,” a place where people would live, work and play next to the “magical” Savannah River. Minor League Baseball has opened a new stadium every year since 1987, he noted. “You’re in for something really, really special,” he said. Bobby Evans, the general manager of the San Francisco Giants – the GreenJackets’ Major League parent club – said Eiseman and Schoen “have been great partners for us,” and talked about how the organization values its South Atlantic League franchise. The GreenJackets have a history of producing top-tier talent, including Madison Bumgarner and Moises Alou. North Augusta’s partners in Riverside Village were also on hand. Aiken County Council and Public School District had to agree to the city’s Tax-Increment Financing plan or the development likely would never have made it past the idea stage. Councilman Chuck Smith and Superintendent Dr. Sean Alford were there for the groundbreaking, along with state Rep. Bill Hixon and state Sen. Tom Young, who represent the area in the legislature.